The decision to hire a professional resume writer presents a multitude of benefits versus writing your own resume. For one, it’s incredibly time-consuming. It is helpful to offload the task to an expert who is up-to-date on the latest hiring trends and resume standards. But beyond that, professional resume writers are specifically trained to excel in the areas that are most difficult for the average person trying to condense their life story onto one or two pages. If your career has been straightforward and you’re confident in your writing skills, it may not be necessary to hire a professional resume writer. But doing so will ensure that you are presenting your experience, skill set, and value in the most marketable way, and positioning yourself as a top competitor for job opportunities. Tailoring their resume to fit the kinds of roles they’re targeting – and often that’s more than one. How to reposition their experience to make a successful career change. Remaining objective in presenting their own experience. Creating an interesting and relevant story. Understanding how they are delivering value, and how to place that into words. Knowing where to condense, where to expand, what to put emphasis on, and what to leave out. Understanding the current trends and standards impacting the hiring process. Crafting a powerful personal brand, and making sure that’s coming through clearly and consistently in all documents. How to customize a cover letter without repeating what’s in the resume. How the heck to use LinkedIn. Not having adequate writing or design skills. We are trained to listen for specific information, know when to ask the right questions, and challenge a candidate to talk about themselves in a manner they’re not typically used to. Most people have trouble articulating their value, impact, accomplishments, and the purpose behind their work. A good resume writer is a solid interviewer AND an exceptional writer. Having design chops is helpful as well since professional presentation is also key. 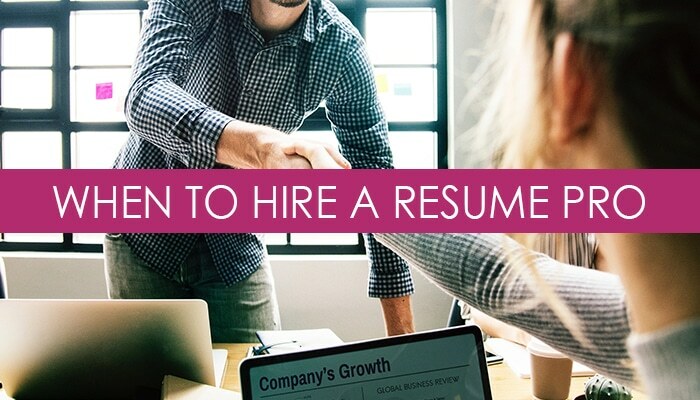 A professional resume writer will help you get everything on paper – all the nitty-gritty details (project, accomplishments, tasks) – and then distill it down into a powerful narrative that supports your brand message. Not sure what your “brand message” is? That’s a resume writer’s job as well – to help you understand what your brand is about, where you add value to an organization and create an impactful message that will pique the interest of hiring managers. If you are getting tons of interviews, you may not need a resume writer. But even after working with thousands of candidates, I’ve yet to see a resume come across my desk that couldn’t be improved or benefit from my expertise in some way. If you’re unsure, reach out to a resume writer and ask them how they could improve your resume and what kind of results you can expect. They should be able to speak specifically to your area of expertise, be able to identify where the resume is lacking polish or effectiveness, then provide you with a general roadmap of what it would look like to work together. Contact us to learn how we can help you create an optimized portfolio of branded marketing tools and an exceptional resume that stands out in today’s ultra-competitive job market. Tags: career, career change, communication, cover letters, hr, job descriptions, job search, job searching, looking professional, personal branding, resumes. Bookmark the permalink. Q&A: How Many Years Should I Stay at a Company?